With a floor space of 64sqm, the cozy holiday home is suitable for up to 5 people. A large living / dining room with TV, a handy little kitchen with gas stove, fridge, kettle, toaster and microwave are also well-equipped for a longer stay. The bathroom has a toilet, sink and shower. One bedroom is equipped with closet and double bed, the other bedroom has a bunk bed and a pull-out bed, as well as a closet. 3 children probably feel well or 2 adults. Sheets, towels, toilet paper and tea towels and dish soap are available. Cleaning products, vacuum cleaner and mop are also part of the equipment of our house. In a common building, washing machine and dryer are available. Enjoy the beautiful, quiet location on your private terrace. The bungalow has garden furniture and a barbecue. For our guests the use of the indoor pool is free of charge at any time. The saunas can also be booked once for free. Combine cultural experiences with shopping pleasure. From your holiday home to the city of Fulda, it is 27km to visit this beautiful city. Or stroll through the old towns of Bad Hersfeld or Alsfeld. Those who prefer to walk should just look around in Wehrda, a typical Hessian town with a worth seeing parish church and half-timbered houses. The red and the yellow castle are presented in the form of impressive country residences. A special feature is the Jewish cemetery, which is very close and can be reached over a long avenue. Another Jewish cemetery is located in nearby Rhina. This 4000sqm complex is designated as a protected cultural monument. From here it is not far to the Protestant church in Neukirchen, which dates from the 15th century. Century and has a magnificent carved altar. A visit to the castle ruin Hauneck in Oberstoppel is also recommended as the visit to the mountain castle Herzberg in about 20km away Breitenbach. My colleague and I rented a bungalow here for the duration of a show in Fulda. We were made to feel very welcome and there was a friendly atmosphere throughout our stay. The bungalow was clean and well equipped and we lacked for nothing. The restaurant on the site served good, inexpensive food, and the beer was great! There is a superb swimming pool on the site although we didn't have time to enjoy it was we were working. The site itself is right out in the country, so it was very quiet, but very close to the main road into Fulda. I would recommend it to folk who want peace and quiet when they return home after a hectic day sight seeing or working! Der kleine Ferienpark hat uns sehr gut gefallen. Die Vermieter waren sehr freundlich. Wir konnten erholsame Urlaubstage verbringen. Die Ferienhäuser haben einen einfachen Standard, aber alles was man benötigt. Selbst Handtücher, Geschirrtücher und Reinigungsmittel sind vorhanden. 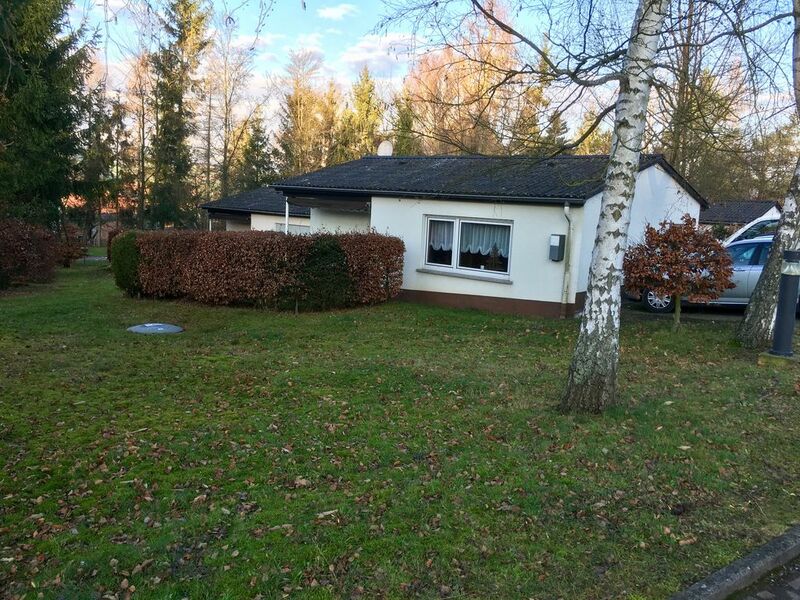 Das Haus ist ausreichend groß. Wir empfangen als besonders wohltuend, dass hier nicht dicht an dicht gebaut wurde. Für unsere Enkelkinder war das Schwimmbad, dessen Benutzung für Feriengäste kostenlos ist, das absolute Highlight. Die Umgebung bietet viele Freizeitmöglichkeiten, so dass wir durchaus erwägen, vielleicht im nächsten Jahr nochmals einige Urlaubstage hier zu verbringen.